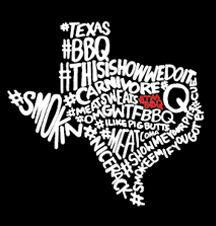 Whether you're obsessed with the fascinating art and science of barbecue, or enjoy the culture and taste of smoked meat, the TMBBQ Club is just for you! 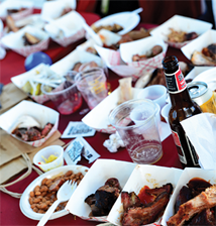 Immerse yourself in the world of mouthwatering barbecue by joining our passionate community of cue-loving, finger-lickin' aficionados. Savor the delicious benefits and enjoy exclusive content, collectible merchandise, special offers & discounts, and so much more! Already a TMBBQ Club member? Only $50 for a year of TMBBQ Perks! 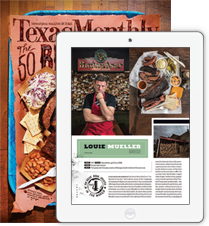 If you are purchasing this membership as a gift, please email MemberServices@TexasMonthly.com. If for any reason you wish to cancel your TMBBQ Club membership, we will issue a refund for all unfulfilled products. Unfulfilled benefits are considered those which have not yet been mailed to the member. The value assigned to each annual print + digital bundle subscription is $24.99 (12 issues); Upon the cancellation of your membership, we will cancel your subscriptions and issue a pro-rated refund for all un-mailed issues. Should you decide to continue your subscription, you may do so for the same rate: $24.99 per year for the print + digital version. Member benefits are subject to change without notice. *U.S. orders only. Please allow 4-6 weeks for your issue to arrive in the mail. iPad and iPhone are trademarks of Apple Inc., registered in the U.S. and other countries. Android is a trademark of Google Inc.